Plus, Liverpool to win and over 3.5 goals this weekend. TOTTENHAM CAN EQUAL a club record of six consecutive Premier League victories by beating Watford in Saturday’s early kick-off at White Hart Lane. Spurs will go into the game with morale high, after Wednesday’s dramatic late win at Swansea. After a somewhat slow start to the season, Danish international Christian Eriksen has been a key part of Tottenham’s excellent form of late. Of his 12 goals for Spurs this season, nine have been scored at home — where the club are unbeaten in 15 league games this season (winning 13 and drawing two) — so don’t be surprised to see him find the back of the net tomorrow. Liverpool have the best attack in the Premier League with 66 goals. However, with 39 goals conceded, of the sides in the top half, only West Brom and Watford have a worse defensive record. They may be missing a key player in Sadio Mane, but Jurgen Klopp’s men still have more than enough firepower to trouble the Potters. Nevertheless, they may well make life difficult for themselves by conceding sloppily in the process, as has tended to be the case throughout this season. Goals generally haven’t come easily to Man United this season — only six Premier League teams have scored less frequently at home. Yet Zlatan Ibrahimovic has been an anomaly in this regard. At 35, the Swedish superstar has taken England by storm, with 27 goals in all competitions. Against a Sunderland side who are bottom of the table and look all but relegated as they sit 10 points from safety, expect the veteran star to thrive. He has already scored once against the Black Cats this campaign, and he could well heap more misery on Moyes’ men at the Stadium of Light in Sunday’s early game. Chelsea will be feeling tired after an intense midweek battle with Man City. And while Antonio Conte’s team will be increasingly confident of lifting the league title after overcoming the significant threat posed by Pep Guardiola’s men, Saturday’s trip to Dean Court will be similarly challenging. Tottenham, Man United, Arsenal and Liverpool (twice) have all dropped points against the Cherries, so Chelsea’s resolve will likely be severely tested again on Saturday. Eddie Howe’s men managed to earn a draw at Anfield during the week, and with Premier League survival looking almost secure, another positive result seems achievable in the late kick-off this weekend. Leicester have won all six of their matches since Craig Shakespeare took charge as manager and the improved form of Jamie Vardy has been a key reason for the Foxes’ recovery. The England international has scored five goals in his last five Premier League matches — before Ranieri’s dismissal his record stood at five in 22 league games this season. Email “Chelsea to slip up and more Premier League bets to consider this weekend”. 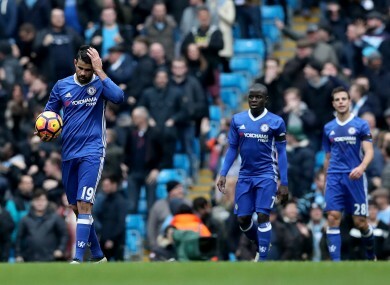 Feedback on “Chelsea to slip up and more Premier League bets to consider this weekend”.